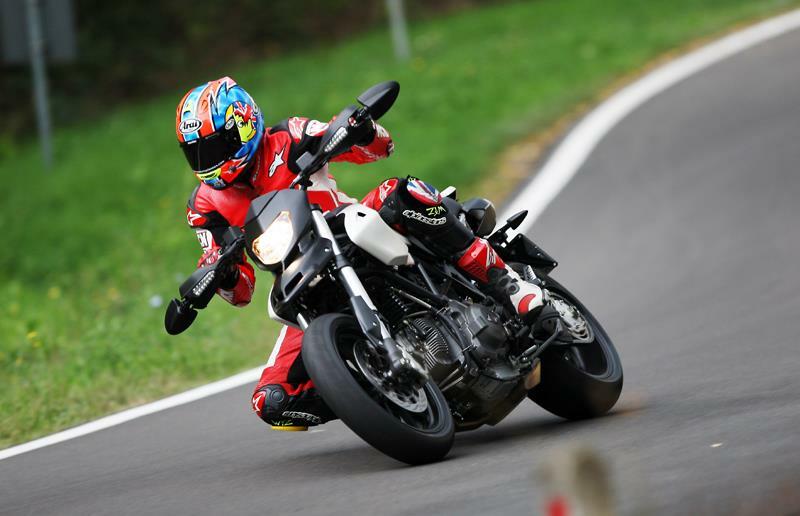 MCN's Michael Neeves has been testing Ducati's 796 Hypermotard in Italy, here he reveals the raft of changes that make the 796 Hypermotard a superior machine to the 1100 Hypermotard. The 796’s seat is 20mm lower than the 1100 at 825mm, making it easier around town and for shorter riders. At just 167kg (dry), the 796 is a useful 12kg lighter than the Hypermotard 1100. The weight-saving comes from the engine, lightened steel chassis tubes and lightweight aluminium Enkei wheels. The fuel-injected, 90° V-twin 803cc engine is based on the Monster 696 lump, but is 1.9kg lighter. It has a new crankshaft, crankcases, pistons and a lighter Ducati 848-style flywheel. The 796 scores over the 1100 by having a slipper clutch as standard, although it’s a wet, not dry, version. Most Ducatis don’t have slipper clutches, but they smooth out corner entries beautifully when changing down the gears. The lighter clutch action and the lack of big V-twin engine braking makes the 796 easier to play at 'backing it in'. Streetfighter-style switchgear and LCD dash. The display doubles as a control panel for the Ducati Data Analyser datalogger, an extra from Ducati Performance. 17in lightweight aluminium rims and excellent twin 305mm front discs that are gripped by radial four-piston Brembo calipers.